But this type, with its combination of white pepper for heat and chiankiang black vinegar and rice vinegar for the sourness is a whole different proposition! As these things do, my recipe has changed over the years I’ve been making it, quite often when I haven’t had one of the original ingredients. So where here I’ve used pickled gherkin, it started off as szechuan preserved vegetables… but the gherkin works beautifully, and in combination with samphire gives the soup the correct salt and tang to go with the basic flavours. I’d never tried samphire in this sort of recipe before, but there were packs of it in the supermarket looking so appealing and wow does it work well! I do think that the soup needs the dried shiitake mushrooms, they give a gorgeous earthy depth that is hard to get with any other ingredient. The potato starch added at the end gives the soup a little more body, but it’s by no means essential. 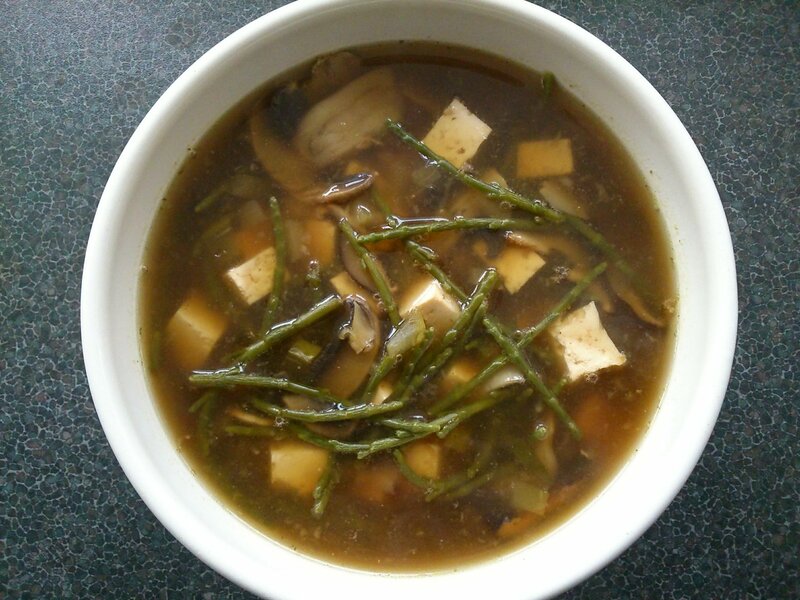 Put the mushrooms (fresh and shiitake), gherkin, ginger, stock, reserved mushroom water, vinegars, tamari and white pepper in a saucepan over a medium heat. Bring to the boil and then simmer for 3 minutes until the mushrooms are starting to soften. Add the samphire and tofu and cook for a further 2 minutes until just heated through. Stir in the potato starch if using.